Wrestlemania 10 in my view was the start of a new era for the WWF. Main stay main eventer Hulk Hogan was gone from the company. Randy Savage was on his way out. Roddy Piper was merely a special guest referee. Workhorse Bret Hart proved to be the man that night by wrestling (and losing to) his younger brother Owen in what may be the best opening match in the history of Wrestlemania and later going on to defeat Yokozuna for the World heavyweight title. I'm not a fan of repeat matches or main events for that matter at Wrestlemania, but the outcome of the match at 10 was much different than at 9, and with Piper as the special guest referee it added something different to the mix. Lex Luger had received a shot earlier in the night against Yoko, but lost when the special guest ref for that match, Mr. Perfect, disqualified Luger, thus turning heel. I had really thought they'd go with a Luger win over Yoko and then have Hart beat Lex in the main event, just to have said Luger had a run as champ. But that never happened, and Luger's push essentially died that night. Doink and Dink teamed up against Bam Bam Bigelow and Luna Vachon. Let's never speak of that match again. Savage ended up beating Crush in a falls count anywhere match. This would be one of the Macho Man's final appearance in the WWF/E forever. Kinda sad to think about that. Men on a Mission nearly won the WWF tag team titles, beating the Quebecers by disqualification which should tell you something about the state of the tag team situation back in 1994. Women's wrestling was back on the card for the first time years, with Alundra Blayze beating former champion Leilani Kai. The Undertaker, who had started his impressive streak 3 years earlier, wasn't on the show. He was selling the beat down he took at the hands of Yokozuna a couple months earlier at the Royal Rumble. 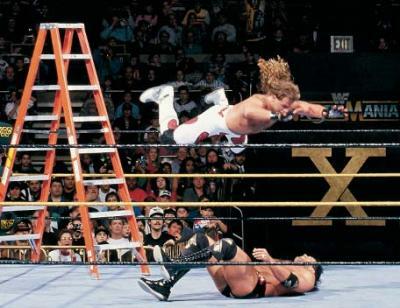 Yes, Wrestlemania 10 had a different look and feel than previous Wrestlemanias, and the match that probably set it apart the most was the ladder match between Razor Ramon and Shawn Michaels. This was the first time a ladder match had been done on WWF television, much less at a pay per view. Ramon and Michaels put on a contest for the ages, it's a ladder match that has certainly stood the test of time and is one of the best ever. In the end, Ramon was the winner, walking out with the Intercontinental title. That match, along with Bret's win and Owen's earlier in the night set a new tone for the WWF. The big man didn't have to be at the helm as champion. It truly was a new generation. What are your thoughts of Wrestlemania 10? Share them here or on Facebook.